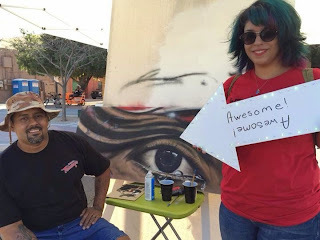 I had a lot of fun with the Awesome Sign I made for the Southwest Maker Fest. Fortunately I let Amber and Jeremy borrow it for a while and they got a lot of pictures taken with it. Our event was such a great success and I can't wait to see us surpass ourselves next year. Thanks to all those who participated in making it great. FYI we keep adding more pictures to our facebook page.